LONDON (Reuters) - UK shares fell on Friday, ending two days of gains as weak metals prices weighed, Burberry sank 5 percent and Wall Street opened lower after a hawkish Federal Reserve statement renewed worries about an imminent interest rate hike. The FTSE 100 (.FTSE) closed down 0.5 percent as negative sentiment on Wall Street and in Asia spilled over across European bourses, while the domestically focussed mid-cap index (.FTMC) was 0.8 percent lower, also dragged lower by a weaker sterling. The blue-chip index notched up small gains on the week as it continued to recoup ground lost in October. 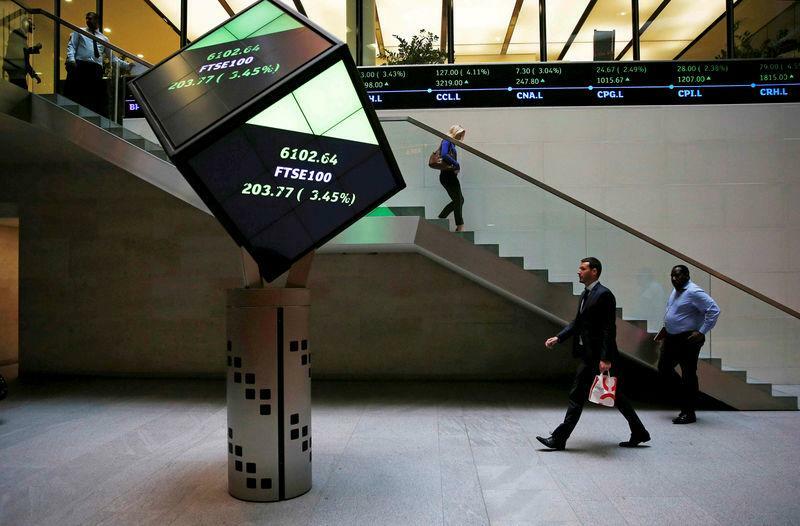 The FTSE 250 was down 1.1 percent for the week. As the pace of earnings releases slows, investors focussed on news that the U.S. Federal Reserve held interest rates as widely expected but indicated it was set for another rate hike in December despite worries about the U.S.-China trade war and political uncertainty. Falling base and precious metal prices as the dollar strengthened and lingering worries about Chinese demand knocked the mining sector <.FTNMX1770> down 3.7 percent, for its worst day in a month. Weaker oil prices also dragged. "Investors are concerned that China is slowing down, and the drop in PPI overnight adds weight to the argument," said David Madden, market analyst at CMC Markets UK. Burberry (BRBY.L) was dragged down 5 percent to the bottom of the bourse as a cautious outlook from Richemont (CFR.S) spooked the luxury goods sector. SSE (SSE.L) shares lost 2.5 percent, their weakest performance in nearly two months, after the energy supplier said it was renegotiating terms with Innogy (IGY.DE) on a proposed retail energy tie-up, reigniting concerns about the outlook for the UK retail market. Informa topped the leader board, up 2.7 percent, after confirming it is on track to meet full-year targets and reported 3.9 percent sales growth in the first ten months of the year. AA (AAAA.L) was the second-biggest faller on the mid-cap, down 7.5 percent after Credit Suisse downgraded the stock.